Poll: Should the IRA apologise to all of its victims? Martin McGuinness has dismissed a report that former IRA leaders are considering an apology. But do you think they should? 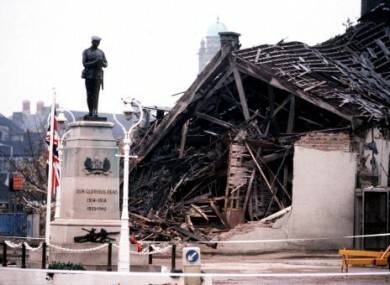 Scene of the IRA bombing in Enniskillen in 1987 which killed 11 people. SENIOR FORMER IRA figures are pushing for an unequivocal apology to be made to all IRA victims, according to a report in the Sunday Business Post. The IRA was responsible for killing around 1,800 people during the Troubles. Although the IRA has apologised before for the deaths of non-combatant civilians, it has never apologised for the deaths of persons considered ‘legitimate’ targets. However, Northern Ireland’s Deputy First Minister Martin McGuinness has dismissed the apology report. He said last night on RTÉ that if people are going to say sorry, “then everybody should say it collectively”, including the British government. What do you think? Should the IRA apologise to all of its victims? Email “Poll: Should the IRA apologise to all of its victims? ”. Feedback on “Poll: Should the IRA apologise to all of its victims? ”.